Successfully Added Dual SIM Smartwatch with Keypad - 1.44 Inch LCD Screen, Keyboard, Bluetooth 3.0, Camera (Red) to your Shopping Cart. This Dual SIM Smartwatch with Keypad with its sporting looks and rugged style brings together great functionality in a small compact watch phone that will bring communication to your writs. With two SIM card slots you can manage two separate numbers directly from your wrist that will bring a high level of organization for personal and professional contacts. A great benefit to the busy lifestyles of the 21st century. The slide out dial pad on this Dual SIM Smartwatch with Keyboard is a truly masterful design as it combines superb functionality with practical necessity. This ergonomic design makes Dual SIM Smartwatch easy to use as you have a full key pad with call and answer buttons that can be used without obscuring the screen and the sliding mechanism let you hide the dial pad when not in use so you won’t accidently catch the buttons. 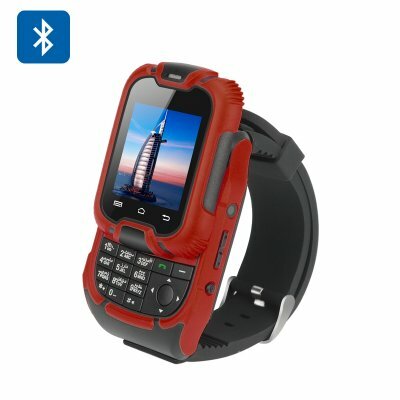 Utilizing Bluetooth 3.0 connectivity allows you to enjoy hands free communication with the wireless ear piece that comes with this mini wrist mounted watch phone. So you can chat away without any inconvenience and have both hands free for whatever else you may be doing. The 1.44 inch capacitive screen offers a clear and straightforward interface for navigating the watch phones functions that include calendar, alarm notifications, music play and even a mini camera for snapping photos throughout the day. These can all be stored on a micro SD card that offers the option for up to 16GB of memory space. With a 300mAh battery you can get around 2 hours of working time or up to 50 hours of standby time which should be more than enough to see you through the day. This Dual SIM Watch Phone comes with 12 months warranty. Brought to you by the leader in electronic devices as well as wholesale watch phones, Chinavasion..